There is an increasing polarization in Greece, instead of a consensus process for real social and political changes. There is a real danger for democracy and the needed social-ecological change towards sustainability but also for collapse of the economy and bankruptcy of the country. We support the move from austerity towards sustainability but what the government does is a real catastrophe for the future of the country and a danger for the European project.GREENS-SOLIDARITY urge the government even at 12 and 5′ to get withdraw the proposal for a referendum before it ends up into a parody and destroys the country. Although it seems that we have elected a left government which – with the participation of populists, right wing ANEL and Ecologists Greens – “fight for social justice”, the reality is total different. There is an increasing cooperation at least in words with nationalists and extreme rights against the European future of Greece. The GGEP has presented proposals for the end of austerity and the promotion of an alternative plan for the way out of the crisis. We supported together another strategy, sustainability instead of austerity. The former governments didn’t accepted a real change, but – what is a pity – also the new government focus a lot on populism instead of a real social-green “transition”. The energy program of the current government is based on increasing the use of lignite and fossil fuels, instead of promoting an energy transition strategy, based on energy efficiency and RES. Its social policy model is based on restoring the old fashion inefficient and unfair social system instead of changing it, following new and innovating approaches. The government decided to spend 500 bl $ for a new military contract in a period of “humanitarian crisis” (social, we call it), and it doesn’t try to reduce military expenses for the benefit of a more balanced fiscal adjustment. The Greens – SOLIDARITY we had emphasized that in order to get out of the crisis we needed a balanced and socially equitable plan that would be based on reviving the economy and its shifting towards a green direction, and in creating abundant, sustainable, decent jobs, as well as in investing in socio-ecological and technological innovation, in strengthening democracy and dialogue. A project that would be supported by the vast majority of political forces and of the society. The previous governments, the current one, and the troika are responsible for the deepening of the crisis. But the government’s decision for forging ahead while we are on the brink, can lead to dismantling the country. The process which the government chooses (referendum in a week without a clear dilemma and without a real and political debate) risks of turning into a parody, since a real dialogue can not be organized within a time limit of a week based, moreover, on totally divisive dilemmas. Equally critical is the fact that, whatever the outcome, there will be no way out of the crisis, but rather a deepening of it. We call on the government even at 12 and 5′ to withdraw the proposal for a referendum before it becomes a parody and before it destroys the country. We call the government to immediately sign an as much as possible more balanced agreement (which will not be good anyway given the collapse of the country) but which, in the future, could be revised. For this purpose, we call the government to open a substantial dialogue with the social and political forces. If the government insists on the referendum, we urge people to vote in full awareness of what each option means. We urge them to voting for the option that keeps Greece in the Europe and the Eurozone and gives prospects for the future through reforms (which we will try to make them “green”) and change of mentality. The «ANEL-SYRIZA government did not come up with a substantially different or better proposal design, than that of the » institutions». Both the proposal put on the table by the «institutions» and the government were equally bad. The choice between heavy taxation and unfair austerity is not the solution. A project focusing on the change of the country, the economy, the state, the social organization and the production model continues to be the only alternative that can lead to exiting the crisis. We will survive only if based on a democratic common understanding, we decide democratically on what must change and how to participate in the necessary changes. We call on the government and its institutions to come directly to an as much as possible more balanced agreement with the possibility of improvements in the near future with socially fair equivalent measures. Unfortunately, the choice is between the unpleasant-difficult and the catastrophic destructive, and not between good and better. The Greens – SOLIDARITY we had pointed out that the only way to get out of the crisis was a balanced and socially equitable plan that would be based on the revitalization of the economy and the shift towards a green direction, to create abundant, sustainable, decent jobs, Investing in social-ecological and technological innovation, strengthen democracy and dialogue. A project to be supported by the vast majority of political forces and society. With the responsibility of governments from the 2000s until today we were led to bankruptcy. The managing the financial crisis under the responsibility of the Greek Government and of the Troika led to the expansion and generalization of the crisis. Instead of making changes involving society in a fair and balanced way, with structural changes in order to live better – even with lower incomes – but with less inefficiency, corruption and waste of human and natural resources. Citizens, with their vote asked SYRIZA to contribute to the change of the country, not to the continuation and deepening of the disaster. This presupposed a knowledge and a plan on how to improve the situation, address mistakes and promote a realistic and substantial change of direction. The SYRIZA-ANEL (plus Ecologists-Greens?) government unfortunately did not present a significantly different plan or better than that of the «institutions». Both the plans, of the «institutions» and that of the government, were just as bad, while in the meantime the economic and social situation, largely deteriorated. From measures of 1 billion in February, we went to measures of 3 billions in March and of 8-9 billions in June, while we know that the country will need an additional 30-50 billion. This evolution is not a surprise since SYRIZA during all these years of crisis and of unfair and destructive policy by the previous administrations did not come up with a better proposal for economic, social and political policies, but invested totally in a negative reaction, in a permanent NO, in order to come to power. Instead of a broad agreement in society and politics, the government of SYRIZA, continued a sterile and destructive confrontation without an alternative plan:the choice between heavy taxation or unfair austerity is not the solution. A project focusing on the change of the country, the economy, the state, the social organization and the production model continues to be the only alternative that can lead to exiting the crisis. The government after making strategic mistakes in the negotiations lost the chance and ability to promote substantial changes in terms of fiscal adjustment programs through alliances and convincing alternatives. Now, with the country being right at the edge of the cliff, lt leads the country into options that might destroy it. A referendum is indeed a democratic way when based on alternative options on which the society is asked to decide after dispassionate and substantive dialogue, exchange of arguments and with the understanding of the consequences of each option. If the government had first signed a plan and put it to a vote in Parliament it could, perhaps, in order to increase its legitimization, put it in a referendum. Then and GREEN-SOLIDARITY and the vast majority of citizens would welcome, we believe, the democratic process. But the process which the government chose is only in semblance democratic. It chose a «referendum» that could turn into a parody as real dialogue can not be organized within a week and under completely divisive dilemmas. Equally critical is the fact that, whatever the outcome, there will be no way out of the crisis but, instead, deepening of the crisis. It seems that the question will be: «Those citizens reject the proposal of the three institutions vote Disapprove / NO» while “Those citizens agree with the proposal of the three institutions vote APPROVED / YES «. The government organized a referendum asking citizens to vote NO on a draft agreement that we have not seen in its final form and which may be change while the government has not presented a better draft. With a revealing – for the deadlock in which we enter – motion, the government requested a continuation of funding from ELA for a week up to the adoption of … NO in the referendum! Even if an extension for a week was accorded, then, who will finance the banking system and the economy that will be dissolved? Even if the NO gathered 99.9% what would change since the government, having in February an opinion support of 85%, failed to negotiate and achieve a better and balanced agreement? The next day of a NO outcome, it would lead to greater risks in terms of social cohesion and the economy as the impasse would be absolute. If the government «loses» the referendum, could implement a plan which, it declares, is «humiliating» and «embarrassing»? What legitimacy would continue the management of a deep crisis at the base of an agreement that it denounces? What is happening has nothing to do with a democratic choice of options but rather with a plan of childish irresponsibility that leads to disunity in the style «patriots – germanotsoliades», «Greek- traitors.» The exit from the crisis requires the consultation and dialogue. The totally irresponsible political system, however, managed to not only lead the country to bankruptcy but also to deeply divide the society on the basis of the absolute good and absolute evil. GREEN-SOLIDARITY urge the government even at 12 and 5′ to get withdraw the proposal for a referendum before it ends up into a parody and destroys the country. To immediately sign a more balanced agreement (which will not be good anyway, given in addition the collapse of the country) but which could be revised and improved in the future For this purpose the government should open a real dialogue with the social and political forces on how then to improve the agreement, presenting more balanced equivalent measures in a short delay. At the same time the government should set as the main prerequisite for signing the agreement the adoption of a comprehensive financial plan and the mobilization of additional financial tools for reviving the economy, combating poverty and the absorption of large unemployment in qualitative, sustainable and decent jobs covering existent social and ecological needs. In a second phase, to discuss debt restructuring to become viable. If the government insisted on the referendum, we urge people to vote, but with full knowledge of what each option means, not to vote again based on illusions and hoping that what they vote will not be what will happen. 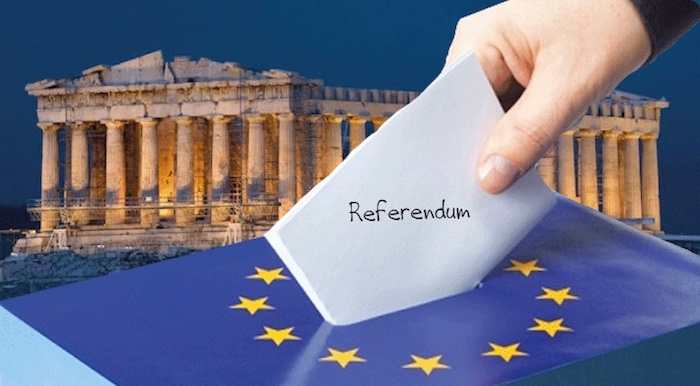 We call in this case citizens to vote option that keeps Greece within Europe and the Eurozone and gives prospects for the future through reforms (which will try to be green in color) and changing of mentalities. The choice is between the offensive-difficult and destructive, unfortunately not between good and better. Citizens giving uncritically majority occasionally at parties such as New Democracy and PASOK, and recently to SYRIZA -ANEL have also their share of responsibility. The political system is a mirror (and) of the refusal of citizens to take their share of responsibility and we must come up with alternatives to wrong or destructive policies. We will survive only if we democratically agree on what must change and on how to participate in the necessary changes. The “deus ex machina» doesn’t exist. Η ώρα του μεγάλου αλλά διαφορετικού Ναι, γιατί κάθε ναι δεν είναι ίδιο.